On the home front: a few years ago, I pumped up our view from driveway to front door with plants for pollinators. Instead of sparse grass in this part shade arena, now I’ve got plants that excite us and wildlife every season. Blooming this week: native rock rose (Pavonia lasiopetala) silver ponyfoot, Salvia regla and eyelash sage (Salvia blepharophylla). Fluffy asters need cutting back a few inches! Our wildlife value water as much as we do! Any time of the year—but especially in hot times—a birdbath or fountain helps thirsty critters make it. 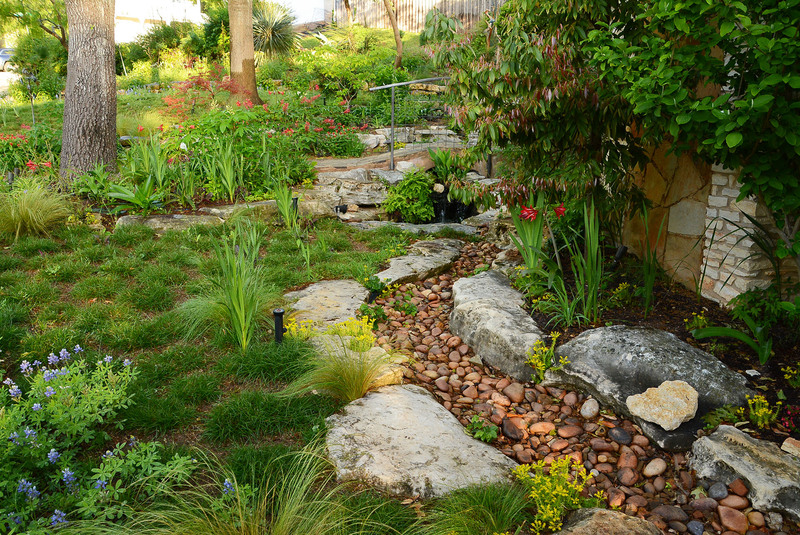 SO, save the date for the Austin Pond Society’s 23rd Annual Pond and Garden Tour on June 3 & 4. As always, meet the owners for hands-on tips on how they did it. This year’s “Backyard Bliss” ponds and gardens include all styles and sizes to match your dream! I well remember when building a pond or stream or even adding a fountain was quite adventurous! Before the Austin Pond Society, many gardeners considered them a wondrous feature at botanical or estate gardens, instead of DIY projects like Bruce McDonald’s pond garden. Now, even small spaces pump up wildlife visitation and soothe our cluttered days. This week, Steve Kainer from Hill Country Water Gardens & Nursery joins Tom to show off the latest pond plants, fertilizer tips, and algae control. 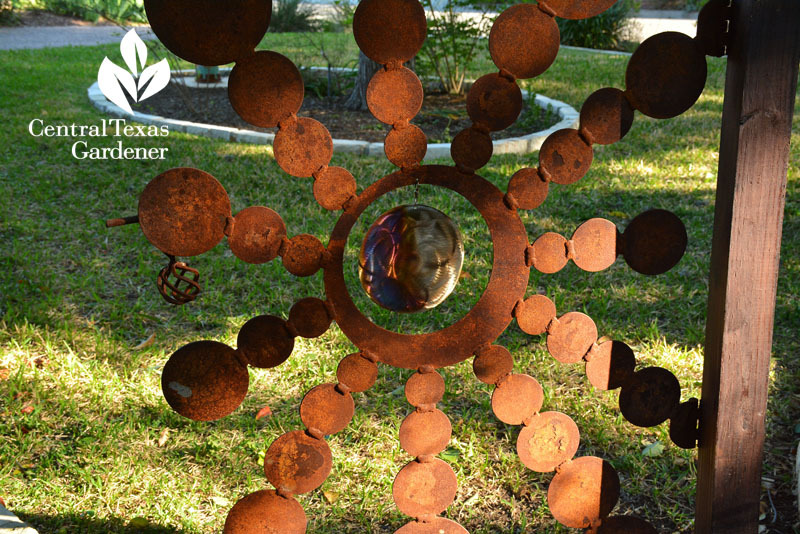 Innovators from the beginning, Hill Country Water Gardens & Nursery continue to dazzle us with ideas, solutions, and beauty. Check out this bountiful burgundy ‘Yucatan Princess’ (Alocasia sarawakensis). Water lilies are gorgeous, of course, but I love this structural, gentle Arrowhead (Sagittaria montevidensis). This blue rush connects nicely, I think, to those structural succulents that may be in your garden, too. And dwarf papyrus explodes in spikey yellow. Watch now for all of Steve’s tips! 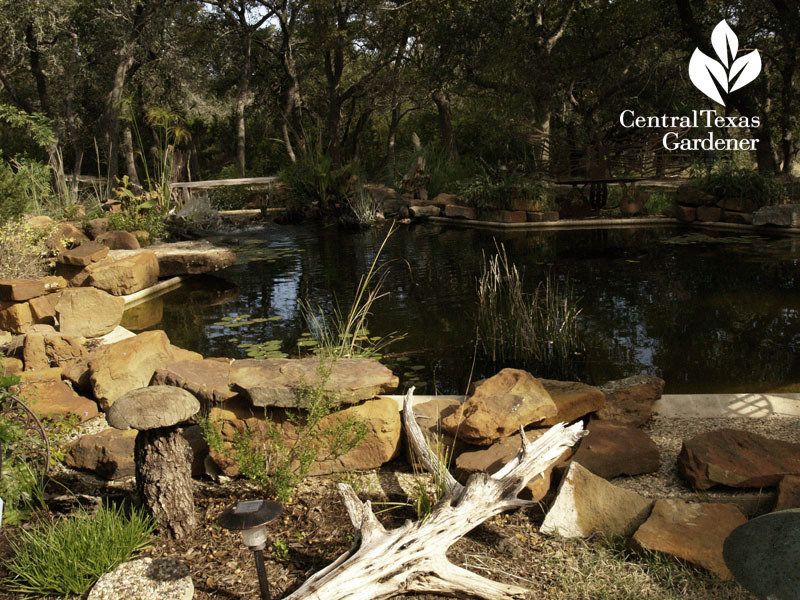 On tour in Wimberley, Irene Anderson and John McMillan designed a naturalistic pond beneath heirloom live oak trees. What’s so different about that? Well, until recently, this pond was a swimming pool. Rarely used, the pool was a maintenance headache. Irene’s son, Chris Smartt, suggested turning it into a self-sustainable pond. “The philosophical part of it was to create something that was as natural as possible to promote life, not kill life,” he said. It became a family project, including John’s daughter Sarah McMillan and husband Clinton Robertson, biologists for the Texas Parks and Wildlife River Studies program. At the deep end, they built an island to replicate a pond bank, supported by cinder blocks and metal framework. Underneath, the pump sits at the very bottom of the pool. Tubing runs up through a rock for a natural looking waterfall. They designed shallow points for some plants and lots of hiding places for fish under cinder blocks. Aside from dividing plants now and then, they don’t have to manage the water clarity at all. “I don’t put anything in it—nothing—we have put absolutely nothing into this water,” Irene said. On the perimeter, Irene arranged plants for fragrance and pollinators. “We used the rock to create above ground beds that look natural all along the edge of the pond and then interspersed other native rocks to soften the edge,” Chris said. Irene and Chris collaborate in their mom-and-son Sol’stice Garden Expressions in Dripping Springs. Along with locally grown, drought tough plants, pick up garden art and furniture styled by artisan designers and unique creations by Chris.